Expedia UK is making fantastic wall art. Expedia UK is making wall art and we're totally into it. 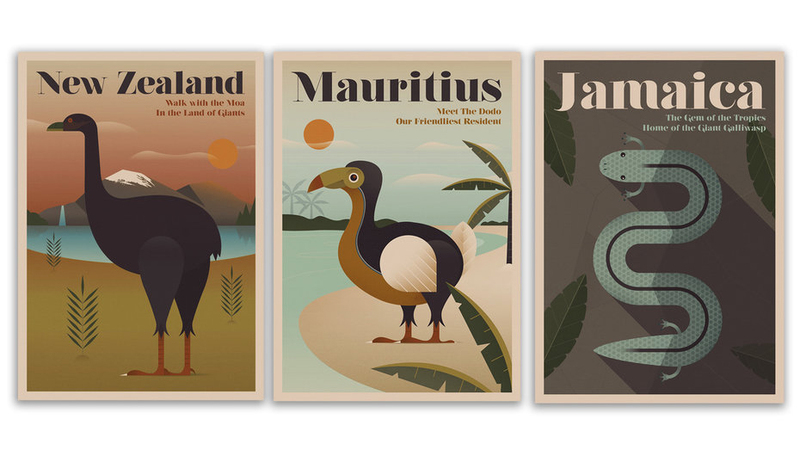 The travel company recently unveiled a series of posters putting extinct animals in the spotlight. Each one highlights a specific region in the world and an animal that at one time called the location home. Despite being long gone, in some cases, many people still group these animals with their given locations. For example, the Dodo—an adorably flightless bird—hasn't been spotted around Mauritius in close to 350 years, but they're still an unofficial mascot. Other animals and regions to expect from this series: the Giant Galliwasp of Jamaica, Alaska's Sea Cow, the Moa of New Zealand, and Tasmani'as Thylacine, among others. You can check all of them out on the Expedia website.